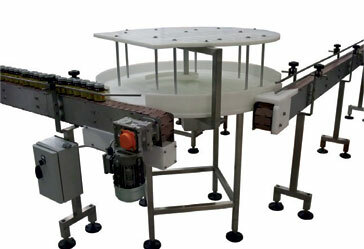 UPM Conveyors has developed a new version of its Rotary Table (Lazy Susan) to operate either as an integrated part of a product handling system or as a standalone unit to act as a buffer when required for accumulating and unloading product, also ensuring total evacuation. Incorporating variable speed control as standard, at £1600.00 UPM claims it is the most competitively priced of such units on the market. An Optional Extra is the overhead mounted multi adjustable product flow orientation guide to ensure ‘first in first out’ of product. UPM also guarantees the elimination of any operator trap points as the underside of the table is totally enclosed and conforms to all relevant health and safety legislation. In feed and out feed belt conveyors can also be supplied from a standard range of plastic link belts which include 90 and 180˚ bends.